How do you make nutritious meals that students want to eat? How do you use the actual cafeteria space to entice students? How can you accomplish these things on a limited budget? One critical component to answering these questions and more relates to the importance of the school cafeteria serving line. Across Florida, school nutrition directors and in-school cooks face a whole range of challenges, from regulations to nutrition standards to economically-challenged student populations. One important factor that can help solve these problems for all Florida school districts is student participation, and one way to increase participation is by improving school cafeteria serving lines. It all starts with the lines. Literally. Kids don't like to wait. In fact, in many cases they can't wait. School lunch periods can often be 30 minutes or less, and this means a long wait in the serving line can result in only minutes to consume an entire lunch. Some schools have even tougher requirements and must serve every student in the school in a single lunch period. There are consequences to this. For students who cannot wait, what this eventually means is reduced participation in the school's nutrition program. Students might opt to bring lunch from home or go off campus. Or worse, they might not eat at all. Participation is truly the key. The other factor that makes school cafeteria serving lines so important is the overall design element. Even students eat with their eyes first, and that process begins when someone enters the school cafeteria. 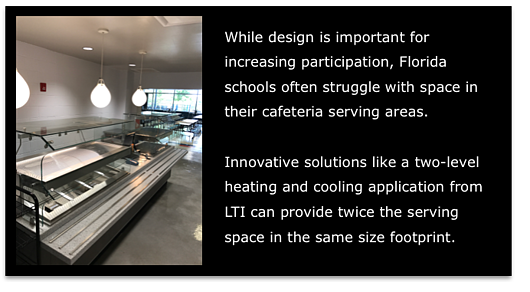 Enticing school serving line designs that promote school spirit, are spaced properly for greater visibility, and reflect the qualities of the food being served will also increase student participation. Do you want students to use the salad bar more? Create enticing design elements that will make that part of the cafeteria more appealing. Sometimes it takes a makeover. What can a school cafeteria experience from a school cafeteria makeover? In our experience working with school districts in Florida school cafeterias, we've seen schools increase student participation by more than 30 percent - just by improve the serving line. When you calculate these numbers over the course of the year, a new school cafeteria serving line can pay for itself within the first year of being installed. To learn more about school cafeteria serving lines and how they directly impact participation, check out our school cafeteria makeover with East Lake High School in Tarpon Springs.